Home › FAQ › How Many Colleges Should I Visit Before Applying? How Many Colleges Should I Visit Before Applying? Visiting colleges on your wish list is an essential part of the application process. Simply researching colleges online or on paper isn’t sufficient. Picking a college sight unseen can spell disappointment and cause you to transfer. There’s no better way to determine whether a college campus is right for you than by actually visiting it. If you’re wondering how many to visit, there’s no magic number. Visiting only one is likely too few, yet traveling to 10 or more could be too expensive. It’s typically recommended that high school students visit at least their first and second choice universities. Schedule campus visits for every college you’re strongly considering. Doing so will help you determine which college communities check off your must-haves. Finding your college fit out of various options is tough. That’s why making the most of campus visits is so important before the application phase. Visiting a college gives you a firsthand view of campus life beyond what’s mentioned in brochures and websites. Visitors are able to sit in lecture halls, walk the quad, sample dining food, and even sleep in dorms. 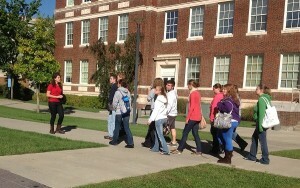 College visits allow you to interact with current students and faculty to answer any questions you have. It’s a great way to evaluate the college’s social scene, campus diversity, dorm size, etc. Many students can then determine where they can comfortably spend the next four or more years. Senior year of high school is stressful enough with balancing schoolwork, social activities, and college applications. Getting campus visits out of the way can lessen the burden. Visiting schools in the sophomore and junior years is often best. If you’re already aware of your Plan A and B colleges, start with them. Mondays through Thursdays are ideal because classes are in full swing. Mid-August is a popular time since colleges begin their semester well before high schools. Taking time to travel to colleges during winter or spring break is also smart. Avoid visiting when colleges aren’t in session though, including exam weeks. Taking a campus tour will show you all of the college’s highlights, but don’t forget to explore on your own. Be sure to visit any campus facilities important to you, such as the library, computer labs, gymnasium, and research labs. Don’t let the opportunity to connect with future peers and faculty slip by. Get involved in information sessions and inquire about extra-curricular activities. If possible, schedule your admissions interview during your visit and introduce yourself to the admissions staff. Don’t be shy asking about campus safety policies, financial aid packages, academic requirements, etc. Take pictures and notes to better compare your campus visits later on. College visits can last anywhere from a few hours to overnight, but they’re always valuable. All college-bound high schoolers should schedule campus visits to decide whether specific colleges are a good match. If you’re ready to begin a college visit, contact the school’s admissions office either by email or phone. Most universities have limited spots for formal visits and organized tours, so make your reservation early. After visiting colleges, you’ll be prepared to narrow down your list of schools to apply to.